Kids are out of school, businesses across Europe are closed, and flights are packed elbow-to-elbow. Ah, it must be August. I arrived in the United Kingdom in the late summer, and this is a rough time of year to plan a trip to England, Scotland, and Wales. Although it’s a beautiful time to visit, it’s also stressful for budget backpacking or budget travel in general. Because my yearlong trip was only lightly planned, I learned the hard way that you have to be on your game if you plan travel around the England and Scotland on a backpacker budget. It’s possible, but it’s a lot of work! You see, tourists from the United States and from all over Europe head to Scotland from July through September; this means cheap accommodation is booked quickly, and tours and food all come at a high premium. Although I had my trusty Lonely Planet Great Britain, which had some budget tips, it only halfway works when you’re backpacking quickly during high season. 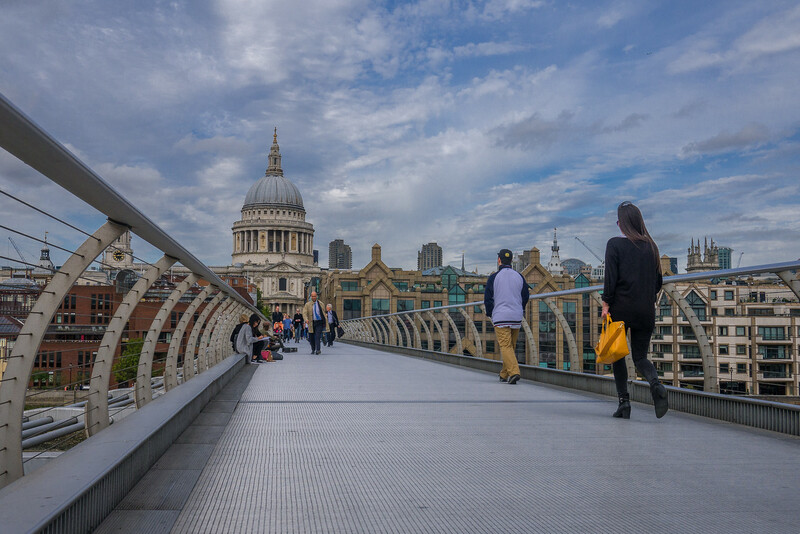 Many sights in London and elsewhere are free—you can visit all the museums, and you can hike in the Lake District without spending a penny. But accommodation and transport prices are brutal if you’re not prepared, and for this reason you really need to plan your trip ahead of time if you’re traveling in the summer high season in England and Scotland, even if you usually like to wing it! There five key points are ones I wish I had known before planning my time in the United Kingdom during the summer. These are the five essential tips that not only saved me money, but made it possible to find transport and affordable food everyday, and somewhere to sleep every night. 1. Book your accommodation ahead of time. I’m definitely a fan of spontaneous travel and rarely do I fully book my trips advance. When I land in a new place, my MO is usually to book the first two nights of accommodation. The rest? I leave that up to whim, luck, and the advice of other travels. 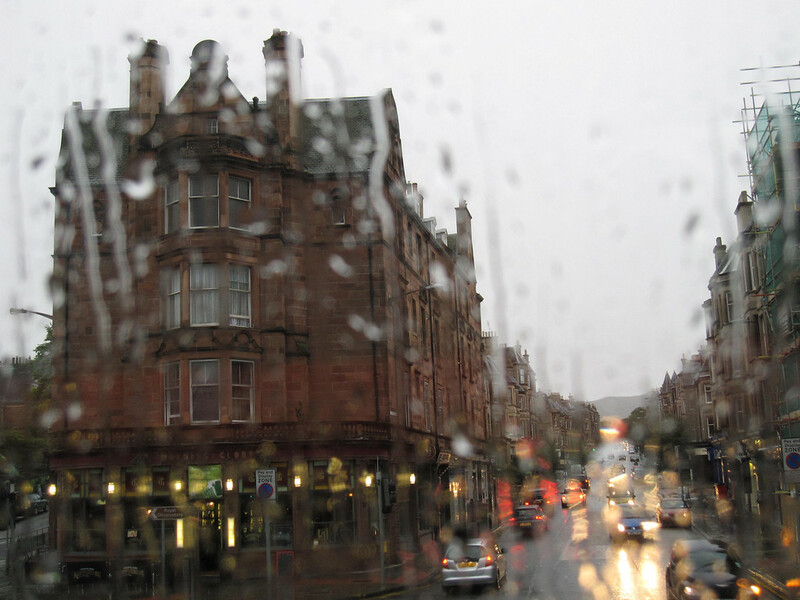 For traveling in England and Scotland during high season, however, that style of travel is extremely difficult. Budget accommodation is booked up, particularly on the weekends. What’s more, even the cheapie beds are expensive. 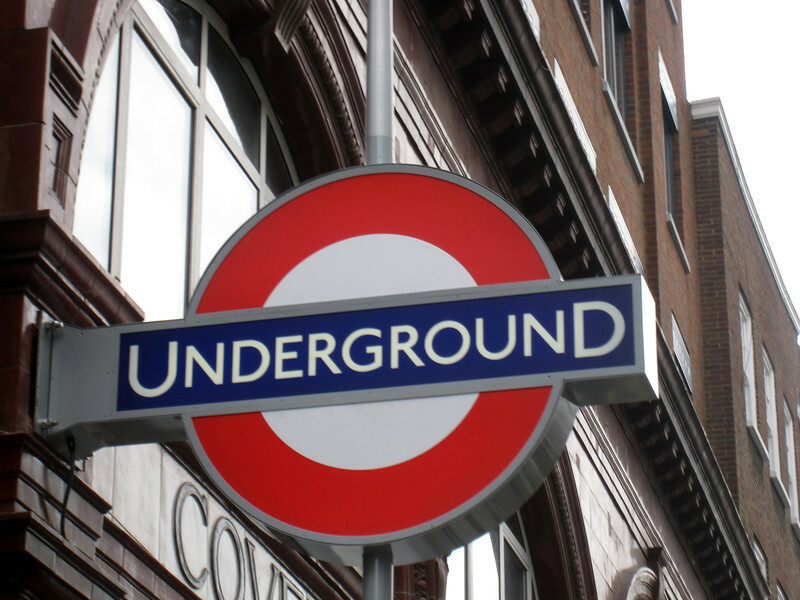 Some hostels and budget hotels in London raise the prices on the weekends. The only way can find affordable places to sleep is through a bit of advance planning. For me, as an American, every price is exchanged from my home currency into the dominating pounds sterling. If you’re traveling on a low budget, the difference of a few pounds extra stacks up quickly. When I first arrived in the United Kingdom., lack of pre-booking meant I ate up a three-day budget in one heartbeat. All because I had to float myself in an expensive city for a few days until the a nearby budget hotel had openings. All of the usual hostel sites work for pre-booking. I usually use Booking.com or a hostel booking website. And I find that advance planning on Airbnb can net you truly great deals if you’re traveling in a group or as a family. Also consider local listing like the Scottish Independent Hostels site—it has heaps of highly tailored local information, as well as local accommodation. Using sites like Horizon App can also work if connections in your networks are using the app, too. If booking ahead of time feels too restrictive and you still want to be spontaneous, consider just booking your accommodation for Friday and Saturday nights. For traveling families, hostels are still a great choice, by the way. Independent hostels especially are family-friendly. Staying in a private room as a family not only costs less for the room, but your family saves money by cooking occasional meals (making breakfast at the hostel is one of the best ways to save money in your food budget!). 2. Plan your transportation well! While trains are faster to be sure, buses are a great way to plan a budget trip in both England and Scotland. The UK train system is both extensive and expensive. Seriously expensive. Buses, on the other hand, offer rock-bottom seats if you book in advance, as low as 1 GBP between cities. I never booked months in advance, so my seats were around 10 GBP—still an absolute bargain considering a similar train ride cost upwards of 60 GBP. The United Kingdom has a lot of bus options. Megabus is the cheapest by far. It’s also perfectly good if it run betweens the cities you’re visiting. 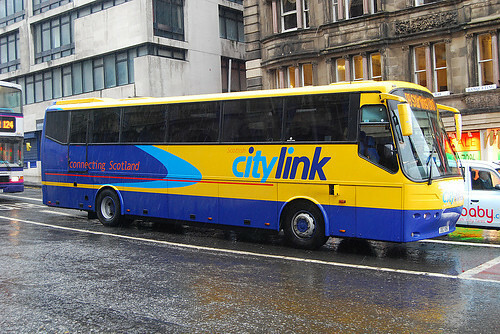 But note that Megabus has limited routes and runs between mostly just the major cities in Scotland and England. CityLink is more expensive but still cheaper than the trains. Traveline Scotland was incredibly helpful in planning my route from one city to another. The website gives precise directions and timetables for taking public transport, and you can even select whether you want to include walking, buses, trains, and metro. If you have the budget, or if you simply prefer the trains, use the National Rail site to plan your UK train travel. It’s imperative that you book online, however, and book a month in advance if possible. If you don’t, the peak pricing can cost double or triple at the ticket counter. If you’re really going to do it right, then a rental car would probably be most ideal. This is actually a cost-effective option if you are traveling with friends. The cost of splitting a rental will equal out when split among you. If you’re solo, you can have that same experience by booking one of the hop-on, hop-off buses that travel around Scotland. 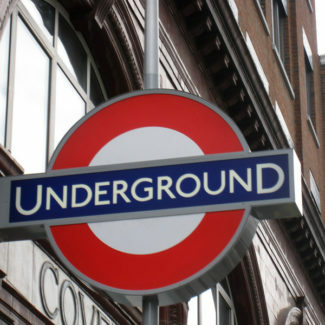 And although the United Kingdom rightly has a fantastic reputation for public transportation, you should always download Uber onto your phone and have that option ready if you find yourself in need of quick transport elsewhere locally. While it’s not as budget as the tube, it’s nearly always a better price than the local taxi cabs. 3. Make a plan for daily your meals. Nearly all hostels and Airbnbs have kitchens—and they are often surprisingly well stocked! With that in mind, I highly recommend cooking your own dinner at least a couple of times a week. Head to the nearest Tesco Lotus (it’s the most reasonable of the UK’s grocery stores). I found the easiest options for a good mix of eating out and eating in was to cook breakfast and often lunch. Pick up some fruit, yogurt, and muesli. Then you could even do sandwiches for lunch, or plan to eat while you’re out exploring and cook pasta and veggies for dinner. It’s also possible to eat affordably in the UK. Head to the pubs for the daily special; this is a great option for lunch or dinner as the specials run at a time of day where you can often use the meal as either one. I used this budget hack from London to Edinburgh, and I always found something tasty and hearty offered at the pubs. As a vegetarian, eating out is a hard in some countries. But UK pubs always have vegetarian options, even if it sometimes lacks much imagination beyond glorified pasta. For this reason, I actually enjoyed cooking for myself, at least when I backpacked through the tinier British and Scottish towns. Also, budget travelers should look for ethnic restaurants. In London, there are many Asian and African restaurants where you can find a meal for perhaps 6 GBP. Or if you eat meat, fish and chips and kebabs are plentiful. It rains, it pours. In short: the United Kingdom is wet. You’re shrugging right now and thinking, “Huh, of course it’s wet, this girl is crazy to recommend this as a tip.” It’s even wetter than you imagine. Budget travelers need the right packing list: poncho, a rain cover for their packs, and a rain jacket. As a budget travel tip, this comes into play because you will be out in the elements waiting for public transport. Although the big cities covered bus stops, there’s little chance you will find covered those in the Scottish highlands. I met some travelers who had to abandon their travel plans because they had spent hours standing in the rain and were either sick or just plain tired. Plan ahead and you’ll be more flexible and happy as you crisscross England and Scotland! 5. Plan to spend more. One of the beautiful things about exchange rates is that you just don’t know what’s going to happen. From the time that I started planning my RTW trip to the time I arrived, the exchange rate from the US dollar to Pounds Sterling fluctuated nearly 50 cents on the dollar. I a lot spent more money than I had initially anticipated. I also had a cushion in my RTW budget, and that meant that I was able to still enjoy my time and not spend the entire visit pinching pennies too closely. Plan for a budget trip, but then add a cushion in case you go over-budget. Think of it in terms of the range of fluctuation. In Asia, when the exchange rate fluctuates it makes on a tiny impact on the amount you end up spending on accommodation. In the UK, however, a change of 20 cents easily mean $4 more a night just for accommodation. Stretch that change across several weeks and you could be grossly over budget going into the rest of your travels. The United Kingdom is gorgeous—I do not regret for a second adding this place onto my itinerary for my round the world trip. It might have been, however, a poor choice as a budget traveler. I decided to visit the UK solely to attend the Edinburgh Fringe Festival in Scotland. I had visited England during college and only remembered hemorrhaging money. I did better this time around, but I could have also stayed longer in other areas without the huge expenses associated with traveling the UK. In the long run, it might have made more sense to save it as an isolated trip, rather than a part of my RTW trip. Planning England and Scotland as an independent/shorter trip it would have been less of a financial strain. Without the worry about my budget holding out until the end, I might have more readily enjoyed a few more pints along the way. That being said, I learned a lot and will be back. Budget backpacking has a learning curve, but there are ways and resources and even budget backpacking books and cost guides to help. Round Ireland with a Fridge: A very entertaining book about a guy named Tony and his adventures around Ireland, with a refrigerator. The Old Ways: A Journey on Foot: This is a fascinating and gripping read about one man’s journey. Robert shares his adventures as he walks from the chalk downs of England up to the Scottish northwest, as well as journeys in Palestine, Spain, and the Himalayas. Notes from a Small Island: In this book Bill Bryson writes about his life and adventures after moving to Britain in 1973. A fun read that will have you searching for flight deals to the UK. Lonely Planet Great Britain: I have tried all of the different guidebook brands, I continue to use the Lonely Planet even as my travels grow beyond backpacking. It’s laid out better than other guidebooks and it has the most thorough budget transportation sections to and from cities—this was essential planning a trip to the the tiny towns in Scotland. Sparkling lakes glistened in the warm evening light as my train sped through England to the far northwest corner, where Lake District National Park sits like a jewel. I had just come from London and the chance to immerse in nature called to me. I admired spectacular rolling hills in rich green hues and the dots of white speckling the creek as sheep wandered their pastures, oblivious to the glorious sunset unfolding over the English countryside. The charm of the Lake District instantly captivated me. It was like entering a Jane Austen novel. After London’s bustle, I welcomed the chance to walk and boat around the Lake District with no set plans, just a series of days ahead that could progress at a pace of my choosing. The country is lush and green and filled with fresh air. With 16 lakes and a number of mountains and hills bubbling over the earth, the Lake District is exactly how I’ve always pictured England from reading books like Pride and Prejudice (an obsessive favorite) and Jane Eyre. 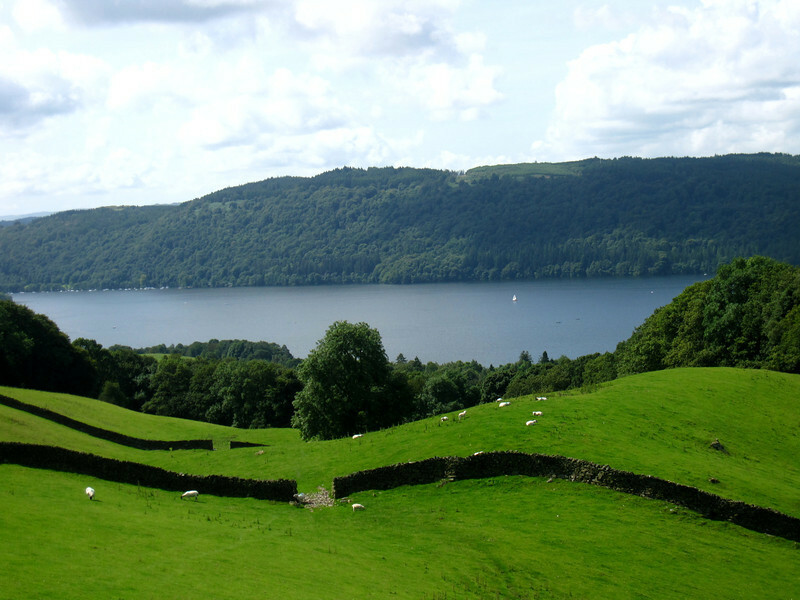 If you’ve also read your fair share of books set in Victorian England, then plan ample time here, where you can take long walks from Lake Windermere, cruise to nearby towns like Ambleside, and putter around admiring English gardens just like a page out of Beatrix Potter’s books. I stayed at a cozy hostel in Windermere that was well connected to town and offered me a heap of advice. Since I wasn’t booking much of my trip ahead of time, my hostel was essentially the only one left with just a week’s notice—the area books up quickly! 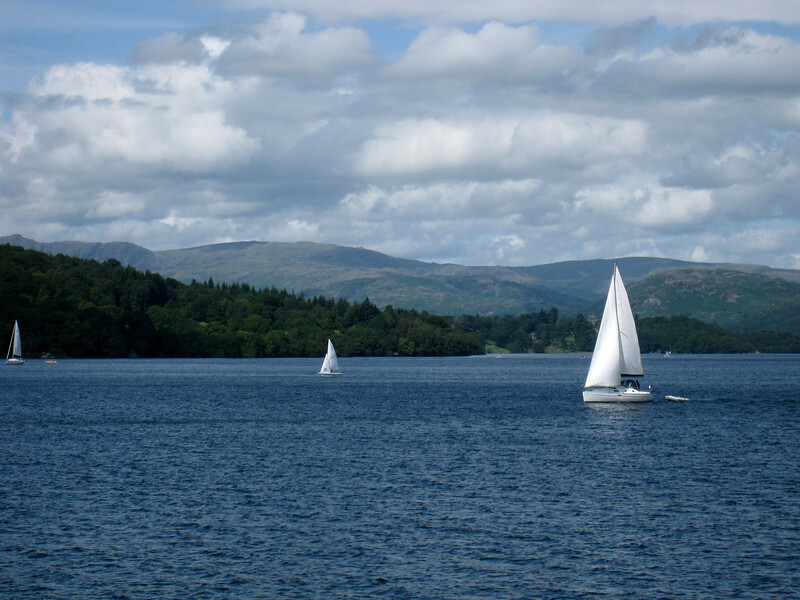 Since my priority was clearing my lungs and getting to know the Lake Windermere area, I bought a boat ticket from the red cruise on Windermere Lake Cruises, and then walked the 20 minutes downhill from Windermere town center to the lakeside town of Bowness. Budget accommodation is all in the town, while pricier places are right on the lake. Although I could have stayed in Ambleside, I liked having a lot of food options, as well as ample places to seek advice on tours and walks. Lake Windermere heaves with tourists during the summer season, and although the town had a fair number, it’s a crush of people by the waterside. A bit overwhelmed, I bought myself an ice cream cone from the homemade ice cream shops liberally dotting the shoreline, which gave me a focus besides the elbowing crowds as I headed to the docks for the 30 minute boat ride to Ambleside, a smaller and more consumable little town further up Lake Windermere. The boat ride is stunning. As the end of my round the world trip nears, I am splurging more on the activities that make a trip memorable. 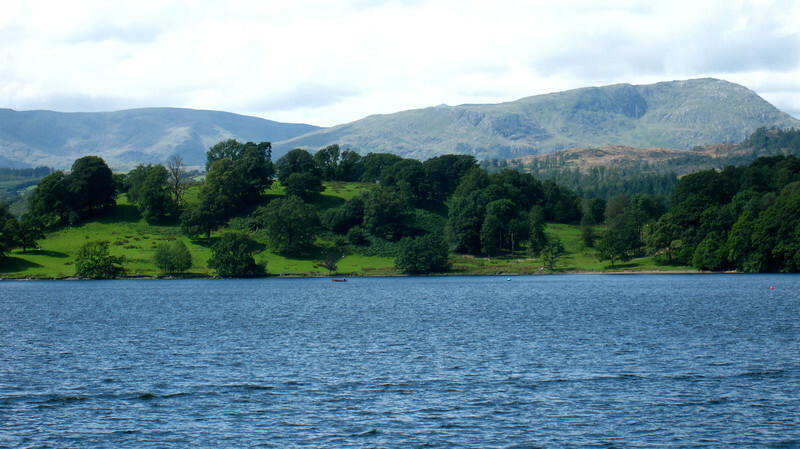 Although the GBP was really strong against the USD, the Lake District is not the place to pinch pennies—small splurges like taking a boat to Ambleside rather than driving are worth the price. Sitting on the water, I was a pinprick of life amidst vast green surrounding mountains. The scale is incredible and best viewed from the water, where you can see everything rise up around you. The open-top boats allow for fantastic views, and I cruised across the waters with the cold wind pinking my cheeks and the crew sharing a small history lesson about the region. The boats are also great for people watching. On the way back from Ambleside, I caught sight of a train of children in small individual boats. They were all strung together in a line of four small boats with two eight-year-old-sized children in each boat. An adult headed this parade of children as he motored toward shore. As I watched these small boats glide past me, life-jacketed and enthusiastic kids waved, nearly tipping themselves in the process. But the kids in the last boat weren’t waving. Both little kids were using small buckets to empty water from their sinking boat. Unsure of what to do, a group from our boat hailed the captain to let him know what was happening! Thankfully, the parade of children was close to shore and all made it out. The kids in the last boat were dripping wet and yet, in the careless fashion of children, seemingly unfazed by the fact that they nearly had to swim 200 meters to shore! The Lake District in England is the perfect place for “just a bit of a wander,” as guesthouse owners and locals say. This quaint phrase is just lovely. Framing a walk with the idea of “having a bit of a wander” sets a different mood than, say, “going for a walk”—even going “out for a stroll” just doesn’t have quite the same charming ring to it. With a wandering mentality front and center after disembarking from my cruise to Ambleside, I hit the ground wandering. Ambleside, like Windermere, is not actually at the water’s edge. Instead the town is a mile inland and a solid 25 minute walk. A small trolley-like car loaded up the families and elderly for a few pounds each, but I chose to hoof it up to the town so that I could explore the local parks along the way, as well as Roman ruins. It’s a perfectly lovely walk for a bit, then it’s rather fenced and decidedly not lovely for about 10 minutes, until you reach the town center. For others, likely just take the trolley. And since getting lost seems to be the theme of my travels, as readers well know, let’s just say that I have really, really explored Ambleside. The tourist lady in Windermere hooked me up with a map of Ambleside before I arrived and she marked a rough route through town that would take in the best parks, and then cap off my time with a 45 minute walking loop to the scenic Stock Ghyll Force Waterfall near Ambleside. Ambleside is a touristy town. All of the Lake District is touristy in August, as I mentioned, so it’s important to take walks out of town to truly experience the best of the nearby nature. Sidewalks in these small towns overflow with sticky children paying more attention to their ice cream cones than the sidewalk, frazzled moms pushing strollers, and families chasing after the above mentioned sticky toddlers! It’s a fun vibe, but not the immersive nature most people hope for when planning a trip to the Lake District. 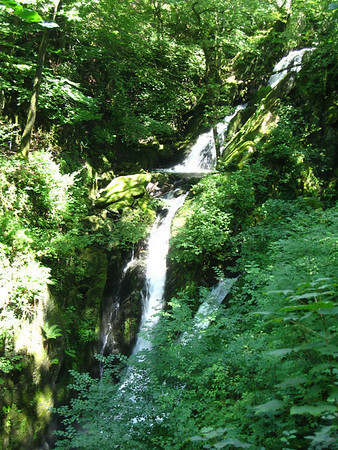 Considering the number of people in Ambleside, surprisingly few walked to the waterfall route. Which is a shame! It’s a simple trail and you can pack snacks and eat lunch near the river, which was what I did. Besides the waterfall, huge parks on the outskirts of the town offer tons of green space for kicking a ball or setting up a picnic, too. After resting in the grass—my “rest” turned into an accidental and impromptu nap—I wandered back through town, past the many boutiques and souvenir shops, and to the docks, which would take me back to Windermere for the night. Being on a backpacker budget, an without a car, I wasn’t fortunate enough to visit many of the small Lake District towns dotting the region, but a couple staying at the hostel came from the northern Lake District and were quick to share that every town they visited oozed charm and offered its own scenic walks. Additionally, I was staying in Windermere both because I liked being in the city, but also because the region was fully booked. On a future trip, I would love the chance to move around some, staying in different towns and exploring Hadrian’s Wall, too, which is close to the Lake District and well worth the visit according to other backpackers. 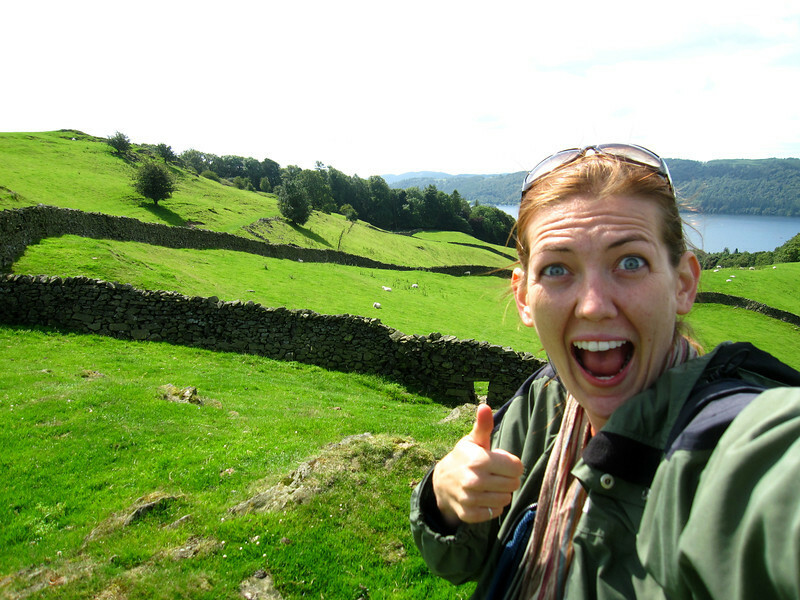 The green sheep pastures of the Lake District were so stunning that I erupted into spontaneous dances of joy. I mean, if you know that you’re completely and truly alone—with only sheep as witness—how could you not revel in the nature, the clean air, and the solitude? I made a pact with myself at the beginning of my yearlong trip that I would learn how to cartwheel by the end of the year. It didn’t happen. While I still can’t cartwheel (drats! ), I spent a good while frolicking in the pastures practicing, and it was lovely to simply be in this gorgeous area. 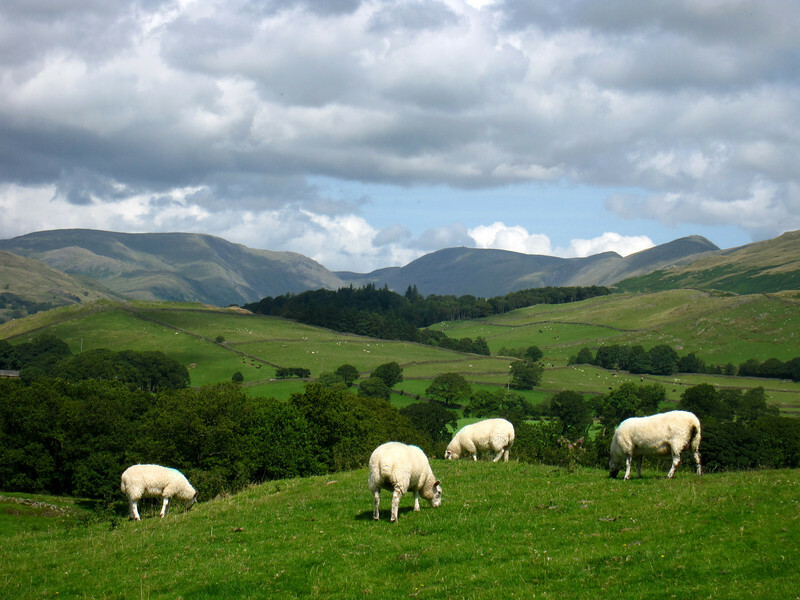 England’s Lake District inspired poets the likes of William Wordsworth. It inspired fits of fancy from Beatrix Potter, creator of the Peter Rabbit stories. Potter so loved the region that she donated all of her land in the Lake District to the National Trust. Today, thanks to her generosity, the National Trust owns huge swaths of land that welcome tourists like me to wander the lightly marked paths, to zigzag the English countryside, and to witness the unparalleled beauty of the lakes. Her home is now a museum, Hill Top Farm, and it’s pristinely preserved. Even if you don’t have kids, you can still imagine Peter Rabbit might emerge the beautiful gardens! 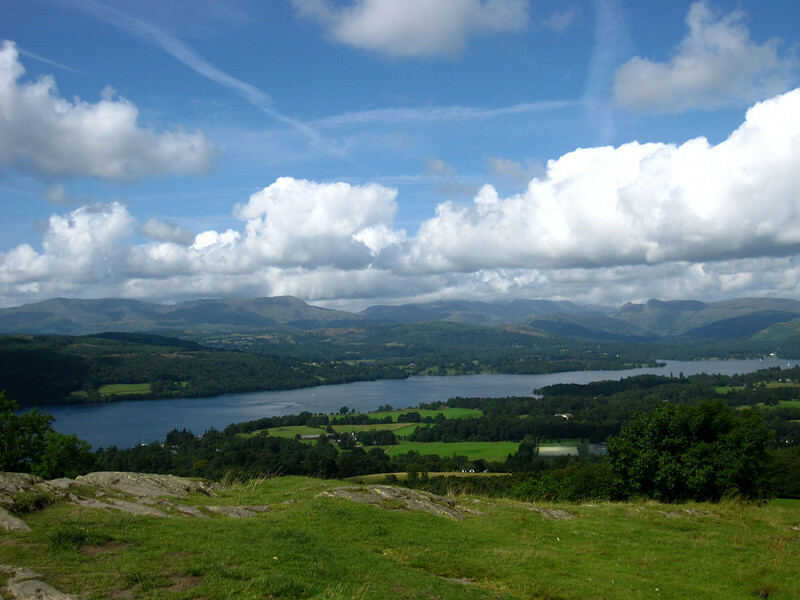 The Orrest Head Walk offers some of the most stunning views in the Windermere region, and the start of the walk is just a short distance from the Windermere town center. Even though the formal route is short, it’s a nice and moderate hike up to a viewpoint, I packed a lunch and decided to make more of a day out of it. I wasn’t game for a strenuous hike, so I took the recommendation of the helpful woman at the information center, who recommended a lightly signposted path that leaves the peak and heads back to town on a large lazy loop through the surrounding farms. Well, I assured her that I could and would and that it doesn’t bother me in the least. 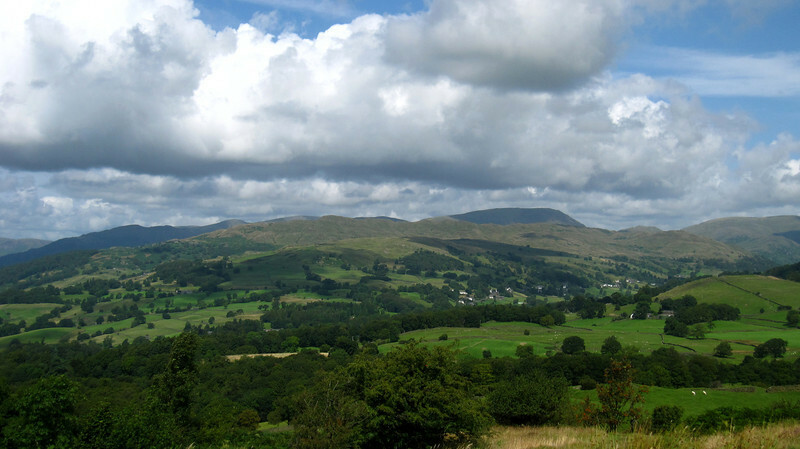 With an apple, water, and boiled egg and cheese sandwich packed into my daypack, I set off to explore the rolling green hills and gently sloping mountains around Windermere. The view is all they say it will be. Stunning. Seriously stunning. I was content to eat my lunch from a small stone bench at the top, and then I had a grand time winding my way back through the green fields while baa-ing at the sheep in their pastures the whole way back to town. Although the Lake District area is crawling with tourists I didn’t see another soul once I hit the pastures. Word of caution: Although the walk to Orrest Head Walk is short and close to town, carry directions from the your guesthouse or the information center because it the trail is not well marked! Even with directions, I backtracked several times before I found the route. And on the other side of the walk, I now think there’s a chance that I wasn’t even on the right path for most of the time! 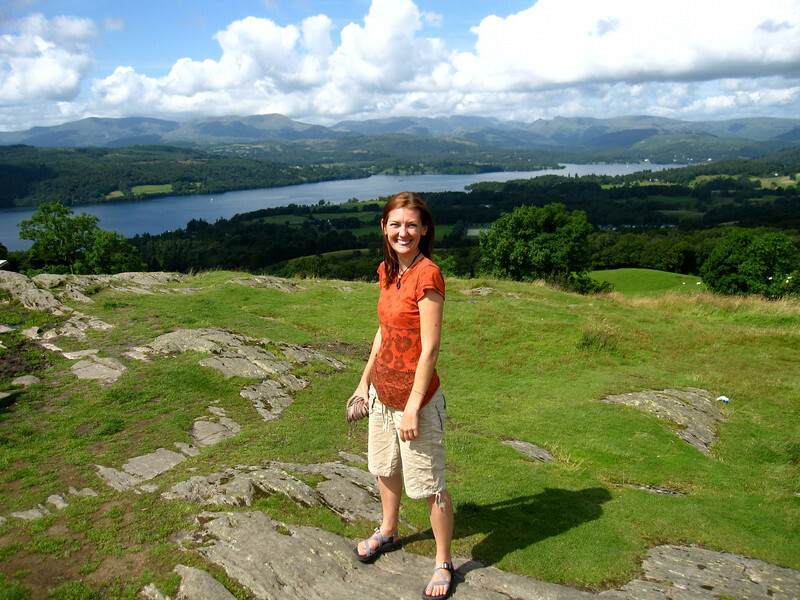 Backpacking the Lake District is perfect for solo travelers like me, who can enjoy a good party, but are more content to explore the nature, culture, and history of a place. Being an active area of the country, the other backpackers were similarly minded—everyone was visiting for the walking, hiking, and boating. I loved that each night in the common room we all gathered and ended a hard day of walking with hot cups of tea and a fierce games of Cluedo. Hikers are, by and large, a friendly group. 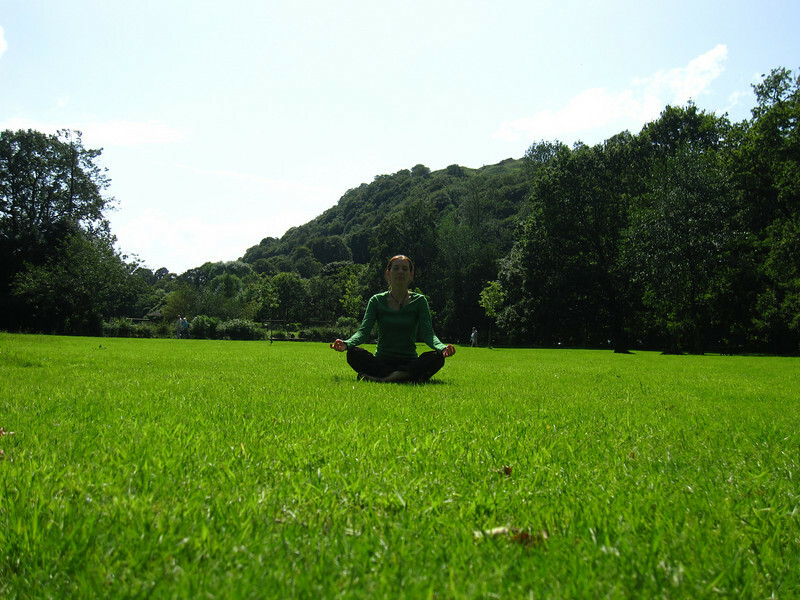 The physical nature of the activity creates a selection process of others keen to take in fresh air and exercise. Everyone on the trails were friendly—they said “hi,” stopped for a chat when I was at a lookout, and generally made me feel less alone even though I walked and hiked solo each day. Hiking is one of the ways that I survived living in Los Angeles LA for two years—it got me out of the city and showed me that there were actually others who needed a break from the sheer LA-ness of the big city. The Lake District, despite being insanely touristy, is fantastic because you can escape from the bustle of day-trippers and sink into nature. You can explore the bigger towns, and the tiny ones, too. Also, I cannot stress enough the helpfulness of the tourist information offices. Because of the huge volume of tourists coming through every summer, they can sort you on most anything you want to do in the region, from biking to walking, hiking, and even some more daring adventure activities. I used the Rough Guide at the hostel for an outline of what I might most like to see, and after a short visit to the tourist information office, I had guidelines for a handful of classic walks ranging from easy-peasy to walks that really got my blood pumping. Getting around: You’ll be enjoying a national park and as such a delicate habitat. 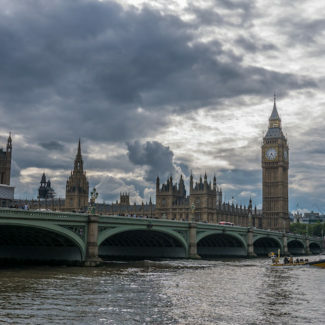 England, in general, has amazing public transportation, and the Lake District specifically has extensive options of buses, explorer buses, trains, ferries, and boats that make it very easy to explore without a rental car (and they deeply encourage travelers to opt for this route). The National Park’s website has links to timetables for public transport in every city and region and is a great starting point. When to go: Summer is the best time as you have a chance at sunshine, a bit less rain (lowest rainfalls occur between April and August), and the countryside is stunningly green. It can be blustery cold on the walks in winter, and some passes and roads close during heavy rains. Where to stay: It’s a big area, so depending on your budget and your goals, you may choose to stay in Keswick, Windermere, or the smaller towns. In Keswick, which is the most highly-rated town for tourist-to-nature ratio, the YHA Keswick is both budget and in a beautiful location, while Howe Keld is just an exceptional B&B ideal for mid-range travelers. 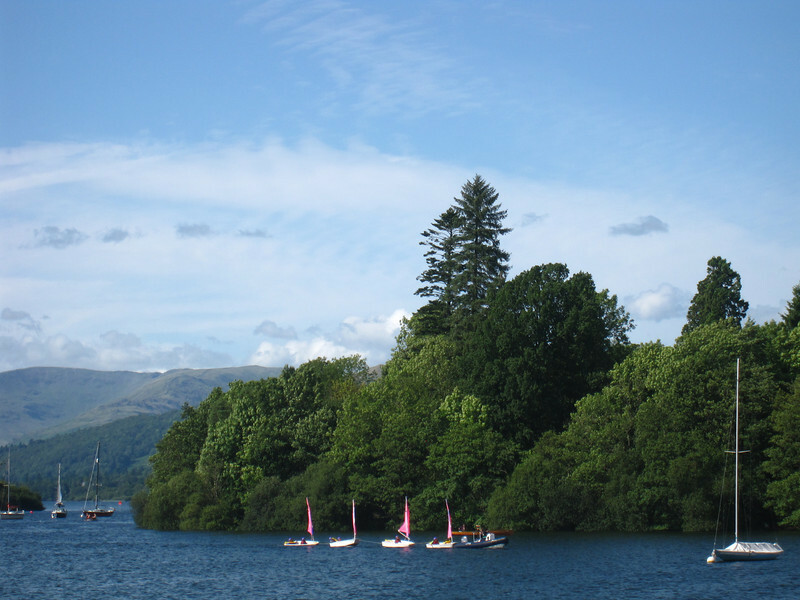 The YHAs in Windermere and Ambleside are both great budget options, or for midrange opt for Elim Lodge Guest House in Bowness-on-Windermere or The Fisherbeck in Ambleside. (Bonus: If you’re new to Booking.com, ALA readers receive a discount on your first booking.) You could also find a great Airbnb if you’re traveling in a group—this is a fantastic way to have access to a kitchen, and also accommodate a lot of people on a budget. Festivals of note: In late summer, most towns in the Lake District have a bevy of festivals. Look out for the Keswick Beer Festival, Lake District Summer Music Festival, Borrowdale Fell Race, and others. The National Parks site keeps a full event calendar. Things to do: There’s a lot to see depending on where you stay. A road trip might allow you to see more, and there are some gorgeous drives, but you can also see a lot using public transport options. 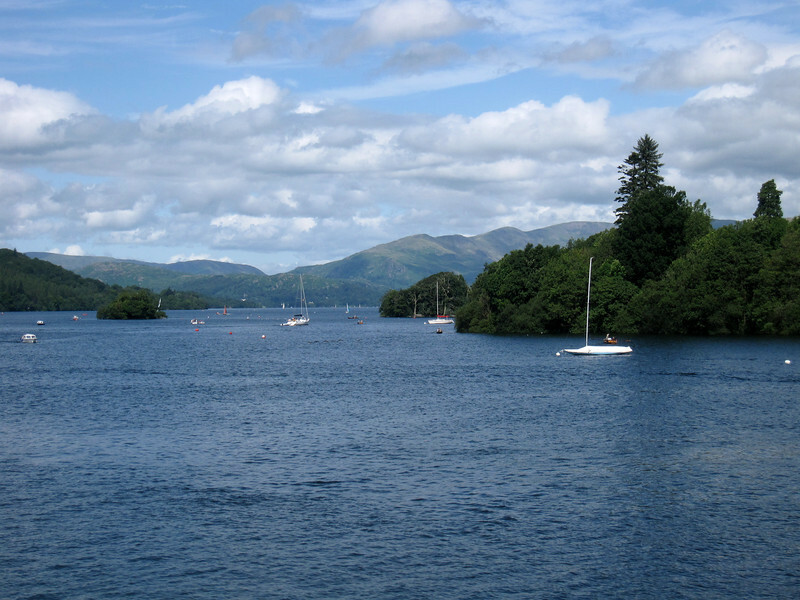 Windermere: Windermere Lake Cruises has a range of options for Lake Windermere. 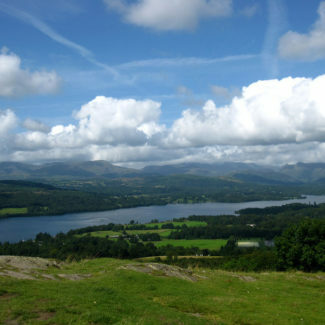 Two great walks from Windermere Town include: Post Knott and Brantfell and Orrest Head Walk. Discover all things Beatrix Potter at her Hill Top Farm and the Beatrix Potter Gallery. 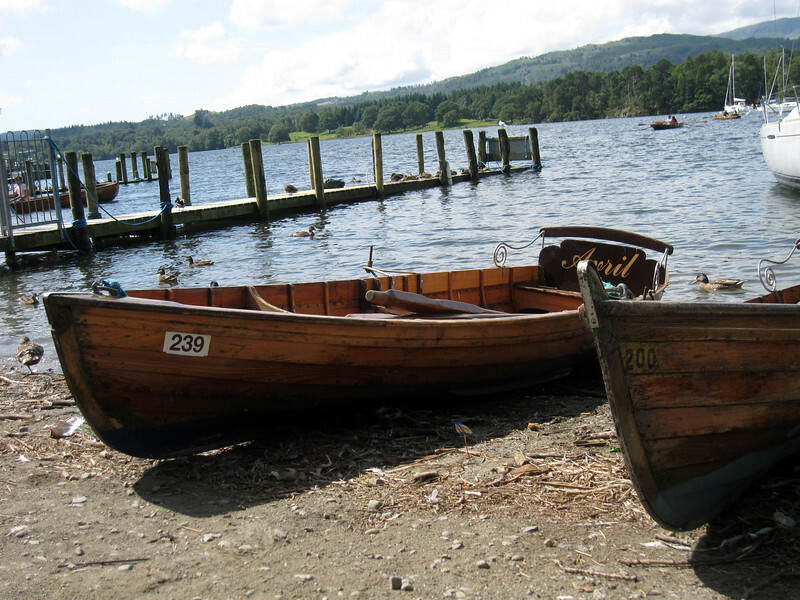 Keswick: If you’re staying in Keswick, opt for an evening cruise around Derwentwater. If you have a car or time for a day trip, the Castlerigg Stone Circle outside Keswick is pretty iconic ring of Neolithic stones that you won’t want to miss. Two great walks near Keswick include: Catbells High Ridge Hike and Buttermere Walk. For a moderately more challenging hike and a chance to see a different area, the Lanty’s Tarn and Keldas Hill hike takes in Ullswater. 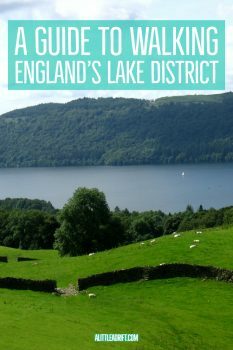 What to read: The Rough Guide to the Lake District is the best guidebook if you want the nitty-gritty details and a good bit of history, too. If you’re looking for a more mid-range overview of what to see and do, you the Top 10 Eyewitness Guide for the era is just great. And if you are a true Potter fan, then Walking with Beatrix Potter is fabulous—great walks and details you’ll love, too. For fiction, freshen up on I Wandered Lonely as a Cloud, a famous poem by William Wordsworth that was inspired by the region. There are all sorts of modern mysteries and thrillers set in the region if you prefer the light and fanciful reads. The Shepherd’s Life: Modern Dispatches from an Ancient Landscape— is hands-down the best non-fiction book and it’s a beautiful, highly rated must read. 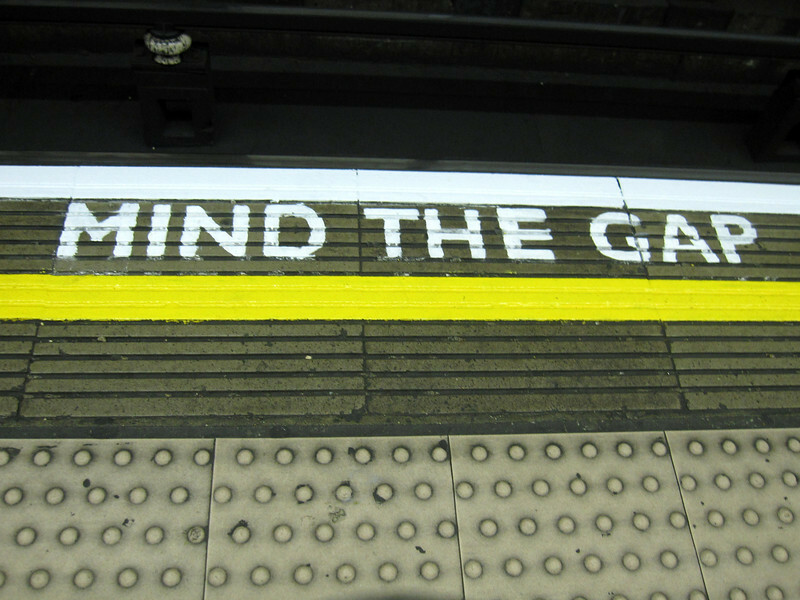 Are there any three words that are more indicative of London than the phrase “mind the gap?” Surely you could name drop the major sites, Big Ben, the London Eye, Westminster Abbey, but for anyone who’s actually been to London the incessant chant of “mind the gap” from the anonymous overhead voice brings me right back to the underground and my days spent exploring the city! 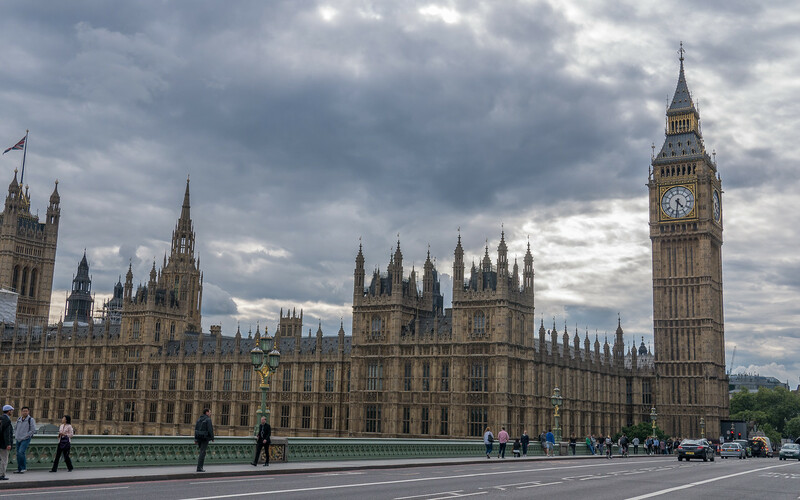 Having already done the London touristy sites during my college-era study abroad program, I decided to spend my days in London aiming for a more local feel, like I had done when exploring Amsterdam for several weeks during a housesit. My luck on the United Kingdom leg of this round the world trip is pretty fierce—I’ve met a lot of people along the way and have several house offers all throughout England and Scotland—I’m hoping that makes it all a bit more affordable. So, although I only briefly mentioned Hannah at the time, I met Hannah while trekking the Annapurna Circuit in Nepal—remember the completely hazy, nary a mountain in site trek? Yes, well she was also blessed with the terrible choice of hiking dates and we bonded in Ghorepani over warm food, hot drinks, a roaring fire, and a mutual love for the Eurodance group Aqua (don’t judge me). Hannah lives in Clapham Common and has a lovely flat with an extra room—perfect for a couch-crashing traveler. She recommended that I purchase an Oyster-card for my three days in the city and it was clearly the best way to get around! The card cost three pounds, but it’s refundable when you return it, and during your tim in London you can load it up with all the money you think you’ll use on underground and buses. This meant I had no fumbling at the door of the bus to count change, I was able to just breeze on and off. It’s also a bargain and a better deal in some cases than the multi-day tourist cards. I definitely recommend London-bound travelers buy an Oyster card when they arrive! As a budget backpacker, it was tips like this, as well as others that allowed me to effectively plan my backpacking trip through England and Scotland! I spent one of my days in South Kensington at Hannah’s recommendation—the museums in London are free so I was able to wander in and out to my heart’s content. The Victoria and Albert is Hannah’s favorite museum, so I headed there I caught a neat exhibit called “Telling Tales.” I’m a nerd at heart thanks to my dad, so the Science Museum across the street was also a lot of fun; it’s aimed kids, but who isn’t a kid a heart, right? Hands-on exhibitions and short consumable facts made it a fun wander. The museums are in a beautiful part of town, an area filled with whitewashed houses and picturesque flower boxes perched on the window sills. Wandering through the streets brought me to Hyde Park and the Victoria and Albert Memorial in Kensington Gardens. I decided to relax and soak in the environment, so I found a shady tree and read my book for several hours, taking in the vibe of locals and tourists also lounging in the ample green space. In search of vegetarian fare for lunch, I headed to the Covent Gardens area for a meal at Food for Thought, an iconic vegetarian restaurant in London that unfortunately shuttered its doors in 2015. 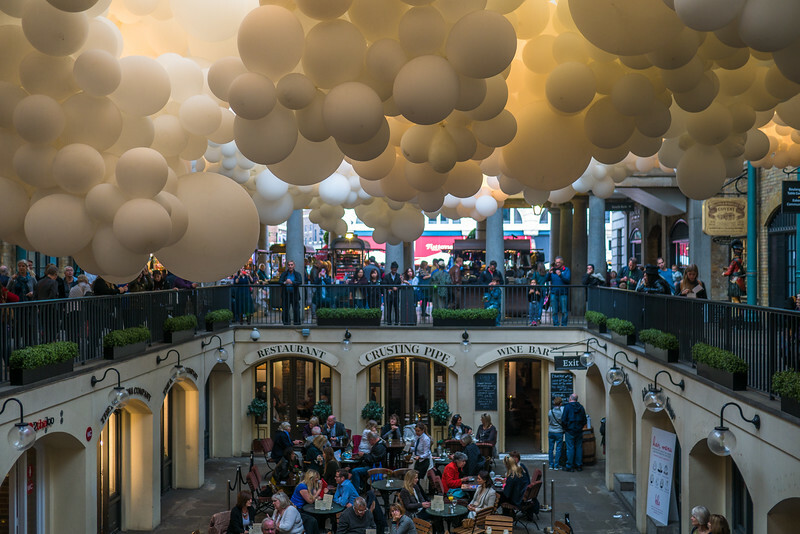 The atmosphere at Covent Gardens was touristy-tastic—tons of street performers and the sounds of buskers wafted through the air. I dodged the many living statues, but it was good fun for a stroll and and window-shopping (since I am on a backpacker budget! I capped off my time in London by sharing beers with two great guys I met in India during the craziness of Holi festivities—they were my street protection for the day! Remember these guys?! Neil and Jordi met me for drinks at a bar on Old Street in the apparently trendy side of town—Jordi works there and it was early enough in the evening that he was able to relax and chat for a couple of hours. I love these guys and it was so neat to have that connection of meeting genuinely nice people and making friendships that carry over outside of the crazy situations in which I met them. 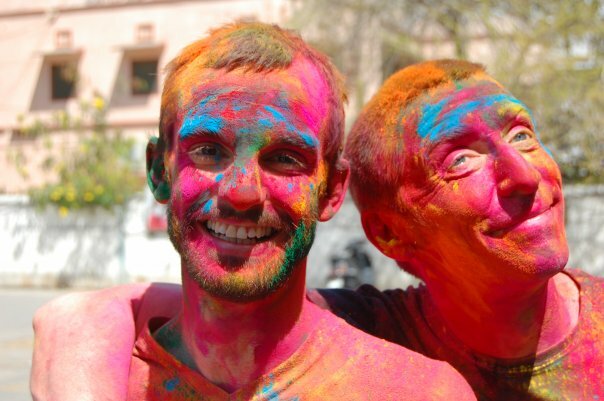 Heck, I’m surprised they even recognized me when I arrived considering the last they saw of me I was coated head-to-toe in the vibrant pinks, greens, and yellows of an Indian Holi experience. For now, it’s a cheers and sincere thanks to my London friends—I didn’t see a single of the “major” sites in London this time around, but I had a brilliant time in the city. My next stop is the Lake District of England, and then further north into Scotland for some hiking and the Edinburgh Fringe Festival. I am at the tailend of this trip, but with a couple months yet, I am still hoping to meet up with friends from the year, and to enjoy every last second I have before heading home.